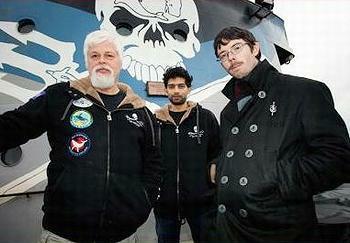 AMSTERDAM, The Netherlands, March 21, 2013 (ENS) – The Sea Shepherd Conservation Society is lodging a second complaint with the Netherlands Public Prosecutor’s Office for serious fraud and environmental crime against the captain and crew of the Nisshin Maru, the Japanese whaling fleet’s factory ship. Sea Shepherd claims that Nisshin Maru Captain Tomoyuki Ogawa and his crew are guilty of piracy, violence against the crew of a sea vessel, endangering safe navigation and the destruction of Sea Shepherd vessels. All are punishable offenses under the Dutch Criminal Code. 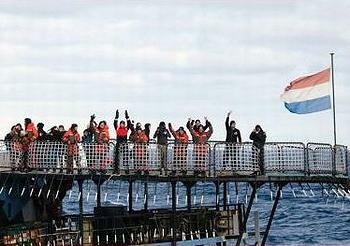 The Dutch Public Prosecutor’s Office has jurisdiction since the Sea Shepherd vessels Steve Irwin and the Bob Barker sail under the Dutch flag and the incidents in which they were damaged took place on the high seas. Sea Shepherd has been demonstrating against illegal Japanese whaling for nine years, and as part of this campaign uses its ships to keep the Japanese ships moving during the whaling season in the Antarctic Ocean so that they cannot haul any whales on board. On February 20 and 25, Sea Shepherd ships were able to frustrate a fuel tanking operation by the Nisshin Maru in protected waters off the Antarctic coast. The Japanese vessels had to refuel from a contracted tanker ship, which was engaged after Australia refused to allow the whalers to refuel in Australian ports. Sea Shepherd alleges that the captain of the Nisshin Maru then attacked these ships by colliding with them several times, using water cannon to flood their engine rooms and sabotaging the engines, and throwing explosives in their direction from the Nisshin Maru. As a result of this, the Steve Irwin and the Bob Barker suffered damage. The Bob Barker was forced to send a distress call, which was later withdrawn when crew members managed to clear the engine room and restart the ship’s engine. Antarctic waters are one of the most dangerous places in the world, and the nearest safe harbor is thousands of sea miles away. The actions of Captain Ogawa of the Nisshin Maru are not only contrary to every rule of good seamanship, but also in breach of Dutch criminal law, Sea Shepherd alleges. The ICR claims that the collisions occurred when Sea Shepherd vessels “sabotaged” the Nisshin Maru’s refueling attempts on both February 20 and 25. The ICR’s version of events is that as the Nisshin Maru was about to come alongside her supply tanker for refueling, the Sea Shepherd vessels Steve Irwin and the Bob Barker and the Australian-flagged San Simon “repeatedly forced their way” between the Nisshin Maru and her supply tanker. The ICR reports there were no injuries to the Nisshin Maru and supply tanker crews. Now that the whaling season is over and the whalers are on their way back to Japan, Sea Shepherd Australia Wednesday welcomed its three ships and 110 crewmembers to Melbourne. But Watson was not among them. He is still at sea in an undisclosed location. Australian Attorney-General Mark Dreyfus Wednesday confirmed that Watson is not subject to any arrest warrant under Australian government jurisdiction. But Dreyfus would not reveal whether Japan or any other country has requested Watson’s extradition, so Sea Shepherd Administrative Director Susan Hartman at the group’s U.S. headquarters in Friday Harbor, Washington, told ENS that Watson is remaining at sea. Earlier this month, Germany dropped an arrest warrant for Watson originally issued last year at the request of Costa Rica. To avoid arrest, Watson jumped bail, forfeiting some $300,000, and left Germany last July. He is still wanted in Costa Rica over a 2002 incident over a shark finning vessel, although Costa Rica has banned shark finning. International Whaling Commission regulations permit lethal “research” whaling as long as the meat is used and not discarded. Whale meat appears at Japanese markets and sushi bars. Japan sets itself an Antarctic quota of 950 minke whales and 50 fin and 50 humpback whales annually despite a global moratorium on commercial whaling that took effect in 1986. 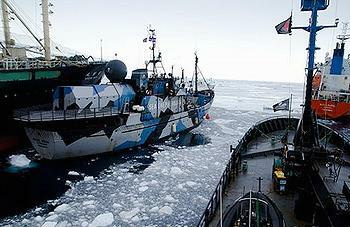 The Sea Shepherd contends that Japanese whaling activities in the Southern Ocean Whale Sanctuary are illegal. Commercial whaling in the waters south of 60 degrees violates the Antarctic Treaty that prohibits commercial activity in the waters around the continent of Antarctica.